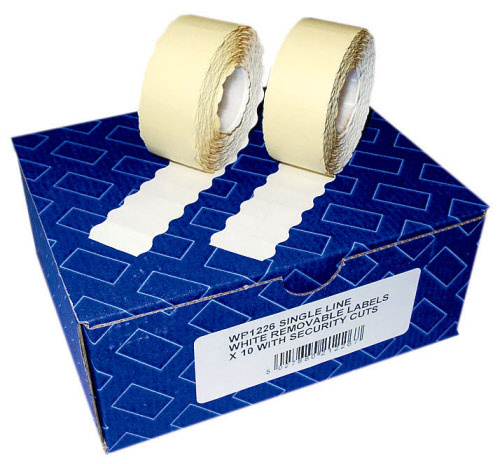 Box of 15,000 (10 rolls of 1500) Avery branded 26mm x 12mm PERMANENT labels in YELLOW. Will fit either the HL1/8 Avery gun or the PG1004 gun. Avery 1/6, Contact 6, 8, Danro 2612, Data-Mark 2612, Dataply 6, Datamark 6, Dataply DPM2612/107Seq, DPP2612/106, DPP 2612/110, Econoply 2612, Evo 8, Evo 10, Jolly JC6, JC8, JC9, Klik K6, K8, Labelmaster, Labeltac MkII, Laser, Lynx A, B, 106, SP1, Euro, Outdoor 6, Outdoor 8, C6, C8N, C10D, C10A, PR426, Meto 526, 626, 826, 1026, 2605, 2606, 2610, Motex 2612/6, 2612/9, date coder, MPS SP1, Nor Numberella, Open C8, C6, C10 C10/A, Prima 1 line, Prix Start 6, 8, 8CP, 10, 10DP, Puma PJ6, PJ8, Sato Kendo 6, 8, Sky Labeltac MK3, Smart 6, 8, 8CP, 10, 10DP, Swing 8, datecoder, Tovel K6, K8, TM66, TM88, Viking 1-line.